In order for NCCU students to achieve student success, best practices in higher education must be available for all students with intentional focus during the first two years of the students’ enrollment and matriculation. Research by Noel Levitz, NSSE, John Gardner, and others indicate that effective academic advising, academic support, personal and career counseling, social interaction opportunities, and leadership responsibilities make for student success during the first two years of college. The University College focuses intentionally, consistently, and qualitatively on academic advising, academic support, academic excellence, career placement, socialization skills, soft skills, and personal, civic, and social responsibility and accountability. 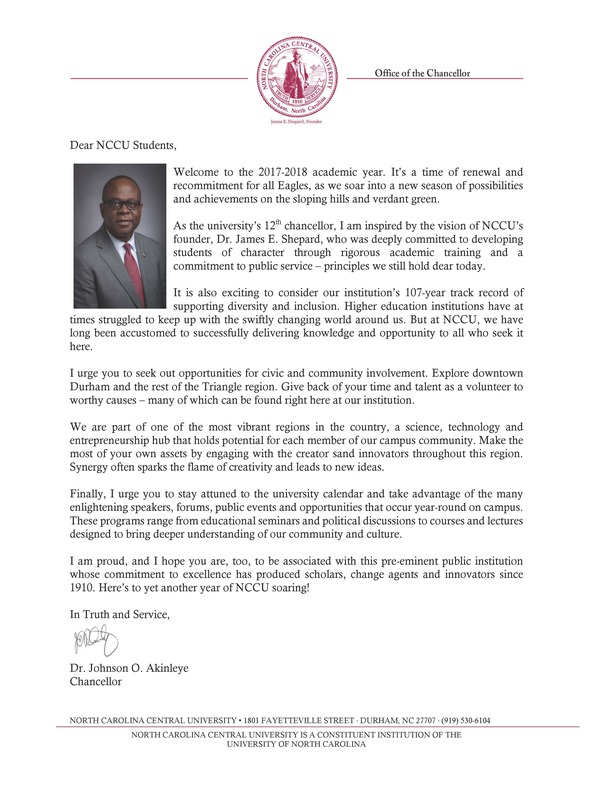 The goals and objectives of the University College enable NCCU to carry out recommendations of the UNC Strategic Plan, specifically those related to Student Success and Access to Higher Education. Several initiatives at NCCU work to promote student success: early warning reports, mid-term grade reports, Eagle T.A.L.O.N.S. workshops, tutorial services, Supplemental Instruction, and learning communities. Yet, more intentional work must be done to ensure success for the majority of our students. The University College fills the void with its intentional focus on student success for all new freshmen, sophomores, and transfer students. The University College is managed by a dean and two associate deans. Core values and specific strategies have been developed with several committees, colleges, and schools across the campus. The purpose of the University College is to provide a means to enhance the successful transition and experiences during the first two years for all freshmen, sophomores, and new transfer students, with an intentional focus on student success. North Carolina Central University’s University College holds as its central focus students’ experiences during the first two years. The mission of the University College is to ensure a successful transition of first and second year students to the point that they become successful during their college matriculation. In addition to promoting the mission of the university as a whole, the University College creates a learning environment that fosters academic commitment, civic and community responsibility, school pride, and life-long learning. To develop and establish a University College that will be recognized regionally and nationally for its record on student productivity and success. Fundamental to the success of the University College are the core values that exist in everything that we do. Students are the source of North Carolina Central University’s success. They should always receive the strongest commitment of the staff, faculty, and administration. The University College encourages effort, support, and progress in first and second year students. Retention is based on the ability to attract and develop students who reflect the mission, goals, standards, and culture of North Carolina Central University. The University College seeks to retain students by providing a positive first and second year experience. Community should be a place where students are nurtured and engaged. The University College promotes a welcoming environment where students have the opportunity to learn from and gain diverse classroom experiences. University policies and procedures, rules, and regulations are focused on enabling the success of students. Academic Affairs and Student Affairs personnel work cooperatively in a collegial process. Goal 1: Assist students in developing clear set goals as a path toward graduation. Strategies: Students will work with Career Services and Academic Advising to set clear defined goals that they will follow to graduation. Goal 2: Encourage students to create interpersonal relationships. Strategies: Students will participate in continuous orientation where they will interact with other first year students as well as upperclassmen and alumni. Goal 3: Ensure students acquire intellectual and academic mastery of subjects and content in a self-directed learning environment. Strategies: Students will begin with general education requirements as well as the UNIV 1100 First Year Seminar class to receive an introduction to college curriculum. At the end of two years they will have mastered core competencies in General Education courses and lower level courses in their majors. Goal 4: Facilitate an awareness of diversity and liberal arts values. Strategies: Students will participate in colloquies, symposiums, and lyceum programs provided by the college and the University College. Goal 5: Develop civic, social, community, and personal responsibility. Strategies: Students will complete required hours of community service beginning their freshman year, thus satisfying portions of this requirement for graduation. Students will participate in student government elections and become registered to vote in local and national elections. Students will develop and complete global awareness projects in peer groups. Goal 6: Create a sense of community and school spirit. Strategies: Students will participate in campus traditions (Eagle pinning, homecoming, etc.) and learn school songs and chants. Students will have the opportunity to interact with area and noted alumni. Goal 7: Meet competencies prior to transition. Students will meet prescribed competencies before being able to move to the Upper Divisions of the University. Demonstrate mastery in analytical, communication, quantitative, and information skills. Demonstrate comprehensive knowledge and practical experience with the disciplines which explore the liberal arts, behavioral sciences, social sciences, and health and wellness. Demonstrate positive ethical and moral behaviors. Demonstrate civic, social, and personal responsibility. Demonstrate knowledge of global learning and cultures by describing clearly how what is done locally impacts others globally. Demonstrate mastery in transferring knowledge from one discipline to another and from one setting to another. Demonstrate teamwork and collaborative problem solving skills. Demonstrate mastery of terms of the General Education Curriculum. Demonstrate the ability to review books and make presentations on the same. Demonstrate competence in using soft skills and technical skills. Complete at least 15 clock hours each full-time, enrolled semester of Community Service Learning. Develop personal goals, commit to them, and monitor goal accomplishment. Obtain and comprehend the purpose and importance of meeting requirements necessary for transition, including the Collegiate Assessment of Academic Proficiency (CAAP) and any gpa or major course pre-requisites. These activities must be completed in order for a student to transition to his/her academic department. The First Year Seminar UNIV 1100 is taught in the University College and is required of all students except those who are age 24 and older or transfers with sophomore status (30 credits or more). This two (2) credit course is designed primarily to help new students successfully transition to North Carolina Central University. It will introduce students to college life, and help them develop skills necessary for their success. The course promotes scholastic attainment, the value of education, self-actualization, involvement in the campus and local community, and leadership skill development with a focus on the mastery of study skills, writing skills, critical thinking, health, and related issues. Academic advising is an integral component of the educational experience at NCCU. In concert with the mission and goals of the University College, the Academic Advising Unit aims to serve all new first-year freshmen and transfer students with regard to their completion of the courses in the General Education Curriculum (GEC) and other first and second year major courses. Additionally, the Academic Advising Unit aims to assist students in reaching their personal and professional goals given the climate of success in which the office operates. Students are expected to meet with their advisors several times per semester. Students with freshman and sophomore credit hours are advised within University College, a unit devoted to student success and support during the period of transition into the university. Students will receive an academic advising syllabus which indicates what will be needed in order to be a competent and successful student as well as what is required to exit the University College and enter into a major program. While many students enter the University with an idea of the major they intend to pursue, the Academic Advising Unit can also provide support for choosing a major. Students are strongly encouraged to declare a major by the end of their freshmen year. Students are required to meet with their advisor in order to register for classes and to review their academic performance. While academic advisors are available to assist students in making course selections as well as providing additional resources for student success, the student is ultimately responsible for his/her success. The University strongly expects students to become familiar with graduation requirements for their chosen major(s), meet with their academic advisor on a regular basis to discuss their academic progress, give their academic work the highest priority, and carefully plan their course selections and sequences. Carefully following these expectations and forming a strong working relationship with your academic advisor can ensure success and graduation from NCCU. Note: The number in parenthesis denotes the number of semester credit hours. *Based on Placement Test Results. The University Testing Center provides full service testing and assessment services to students, faculty, staff, and the local community. Among the many services provided are: planning, coordinating, and administering placement tests in the modern foreign languages (French, German and Spanish); College-level Examination Program (CLEP) offered to university and community candidates; Administration of the DANTE Subject Standardized Test; PRAXIS series (formerly national teachers examination); Test scoring services for university faculty; and computers for word processing and internet access. The University Testing Center also provides the facilities, personnel, and testing resources as a satellite test site for several national and international testing agencies including Prometric, PearsonVUE, UNC Proctoring Network, graduate and occupations testing. A profitable and technically enhanced testing venue, the CBT is operated Monday through Friday from 8:30 to 5:00 offering computer based testing for fifteen different education and certification entities. The CBT Center plans, coordinates, and administers standardized computerized tests according to guidelines provided by the testing entity and specifies the physical and environmental conditions under which the test is to be administered, during the busiest testing period from September to January, the CBT operates outside of the regular hours, running three sessions daily, and on weekends. Testing is by appointment and registration. Walk-ins are accommodated based on availability. Academic Success and Enrichment Services focuses on the enhancement of student performance through tutorial assistance, academic counseling, Supplemental Instruction, individual and group study sessions, Eagle T.A.L.O.N.S. workshops on test-taking skills, stress management, time management, and how to study programs. The program strives for positive image through the use of a “hands on approach,” to improve academic skills. This approach instills a sense of pride and responsibility to maintain satisfactory progress with the ultimate goal of graduation from North Carolina Central University in four years. Academic Counseling Services are available for all students enrolled at North Carolina Central University. However, students identified through our early warning system, mid-term progress report, and academic advising center are targeted to provide needed support and monitoring to ensure their academic success. Eagle T.A.L.O.N.S. (Tackling Academic Learning Opportunities for New Scholars) series are designed to equip the students enrolled at NCCU with the knowledge, skills, and tools to successfully navigate their collegiate experience and ensure that they are equipped to be competitive in a global society. Session topics are chosen based upon the feedback received from student surveys and sessions held during their summer orientation and from observations made through interactions with the students. For the students’ convenience, sessions are offered at 10:40 a.m. break and at 7:00 pm on Tuesdays and Thursdays. Tutorial Services are provided for a wide range of subjects by our undergraduate, graduate, and professional tutors. This is an optional service for most students; however, some students based upon their academic readiness are required to attend a minimum number of tutorial sessions. Students may schedule private appointments with tutors or walk-in for assistance. Currently, GradesFirst is the system students are encouraged to use to view tutor availability and to schedule appointments for services. Supplemental Instruction (SI) is an Academic Support program utilizing peer assisted study sessions to enhance student performance and retention in courses that historically have been identified as having high drop, failure, or withdrawal rates (DFW). Key elements of Supplemental Instruction identifies traditionally difficult academic courses rather than high risk students; SI is not a remedial academic program. Supplemental Instruction provides an opportunity for students to learn how to learn while learning what to learn. Supplemental Instruction helps students actively review course material to prepare for tests, while learning effective study skills and learning strategies necessary for success in the course. Participation in SI is voluntary, free, and open to all students in the course. Supplemental Instruction Leaders attend all lectures for targeted courses (An alternative to arranged for web-based courses.) Supplemental Instruction Leaders are trained in group facilitation methods, students learning theory, and study techniques. Supplemental Instruction program is supervised by trained staff members from the University College. The SI program is only offered in classes in which the academic department supports SI. Supplemental Instruction sessions will begin the 2nd week of classes after students have given input as to when the sessions will be scheduled. Supplemental Instruction Leaders facilitate and encourage the group to process the material. Leaders are not considered experts in the subjects and they do not re-lecture to the participants. The mission of the North Carolina Central University Lyceum Series is to promote and enhance the intellectual, cultural, and aesthetic aspects of student growth and development through a series of outstanding lectures, recitations, concerts, dramas, and exhibitions. Thus, the Lyceum Series contributes to the establishment of a wholesome and well-rounded environment for the university and the local and state communities. All Lyceum Events are funded by Students’ Lyceum fees. Students in the University College are required to attend at least one Lyceum event per semester. The mission of the Writing Studio is to support student learning and work as a writer in the university community through one-on-one and small group collaborative sessions. The Writing Studio is committed to helping North Carolina Central University students and faculty meet their academic and professional goals by becoming better writers. It is open to all levels of proficiency at all stages in the writing process. Services of the Writing Studio include: one-on-one consultation, brainstorming topics, rough draft development, organization of ideas, and fine tuning student writing. The Aspiring Eagles Academy (AEA) is an academically based enrichment program designed to promote the success of incoming freshmen who have been accepted to attend North Carolina Central University. The academy includes a Leadership Institute, a living-learning community, cultural enrichment, study and travel abroad, intrusive academic counseling and focused academic support. Each cohort consists of 40 students, half of whom are first-generation college students. AEA provides the means to bridge the preparation and academic achievement gap between students admitted into the program and those who come to the university prepared with skills and abilities to experience college success. Students who participate fully in the academy will be prepared to face the challenges of first-year students in an institution of higher education upon their enrollment. The Aspiring Eagles Academy does not end when fall semester classes begin. During their first year at NCCU, participants reside together in Rush Hall and participate in monthly seminars to expand their global awareness. They meet regularly with their academic advisors and counselors, attend Lyceum programs, Eagle T.A.L.O.N.S. series and activities planned by peer mentors. Since 1987, the Thurgood Marshall College Fund (TMCF) has served as a critical link between students fulfilling their dream of greater access to higher education and leadership development training, and the opportunity for those students to become part of a new generation of leaders for communities, the nation, and the world. To date, the organization has been the source of dream fulfillment for over 7,500 students who have received scholarships and graduated from college. TMCF impacts 235,000 students annually by providing capacity-building and programmatic support to its 47 member public Historically Black Colleges and Universities. TMCF’s impact on the nation is achieved through its mission and targeted focus on specific areas imperative to developing future leaders. Students at NCCU have the opportunity to participate in a number of initiatives via participation with TMCF. Scholarships - TMCF provides merit-based scholarships to students attending member universities. Students must demonstrate financial need and meet all scholarship criteria. All scholarship recipients are selected by member universities, and scholarship payments are made directly to the school. Leadership Institute - The Leadership Institute & Recruitment Conference is a four-day event that brings together more than 500 of the most talented juniors and seniors attending member universities for a host of workshops on professional development and career options. Students attend workshops, networking events, and the annual fashion show and dinner. This conference also provides an excellent opportunity to meet with top executives from a number of Fortune 500 companies. The Teacher Quality and Retention Program (TQRP) - was designed to help teachers enhance the learning experience of students. Now, more than ever, our students need qualified teachers who can help them overcome challenging school environments and achieve academic and personal success. Historically Black Colleges and Universities (HBCUs) graduate more minority teachers than any other source. TQRP provides one-week summer institutes designed to give education majors experience in the application of educational theories and practices. This training will equip future teachers with the skills they need to successfully enter high-need schools in urban and rural communities. Selected STEM majors will take part in a two-week fellowship designed to expose those considering a career in education to the latest theories and practices associated with exemplary science and mathematics instruction. Program fellows will attend one of four Institutes being held around the country. If you are interested in any of the aforementioned programs, please see the Thurgood Marshall Campus Coordinator housed in the University College in the Alexander-Dunn Building (919) 530-5235. Student Success Services (SSS) is a federally funded TRIO Program that provides intrusive support and quality services with the objective of increasing retention and graduation rates for 140 first-generation college students from low-income families and students with documented disabilities at NCCU. If offers participants personal and academic advising and counseling, tutoring, Supplemental Instruction, developmental programming and financial literacy workshops to overcome barriers to success. Students who meet the criteria will be eligible to apply for TRiO Grant Aid to help reduce their dependency on student loans. The ultimate goal of the SSS Programs is to support, advise, coach and motivate students to successfully complete their post-secondary education at NCCU. Succeed by using all campus resources available to navigate the college experience in fulfilling and rewarding ways while earning their degree from NCCU. New students who have taken two years or more of the same foreign language in high school are tested to determine their foreign language placement unless they choose to study a different foreign language. Students who have not taken two years or more of the same foreign language in high school or who choose to study a different foreign language must enroll in an introductory foreign language course. However, students who transfer foreign language credits equivalent to or above the first level in Spanish, French or German are not required to take the foreign language placement test.